I have had the idea of writing a program for a band with guitar, but without a bass, for a number of years. I am fascinated by the amount of possibilities which this open linup offers, the challenge of exchanging musical roles and functions giving them a new and unusual setting. At a benefit concert for the fatally ill vibraphonist Christoph Eidens a trio like this unexpectedly came together. The chemistry worked so well that it was clear that we had to do further work together. 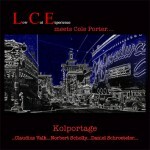 In 2007 we recorded the CD “Kolportage”. This recording only contends songs of Cole Porter which always meant a lot to me. You’ll find them pretty muchde- and reconstructed, the result might rather be a assosiative performance of Porters ideas, in a language, newly created by LCE. With ‘Tribute to Cole ‘L C E encounters the music of Cole Porter with the task of giving it new expression and showing it in a more contemporary setting. Compositional and improvisational arrangements of the song material in the regrouping of ‘form and colour’ portray new contours, emphasise certain aspects of the original, smudge others. Something emerges which throws new light on an otherwise known aspect of the music. 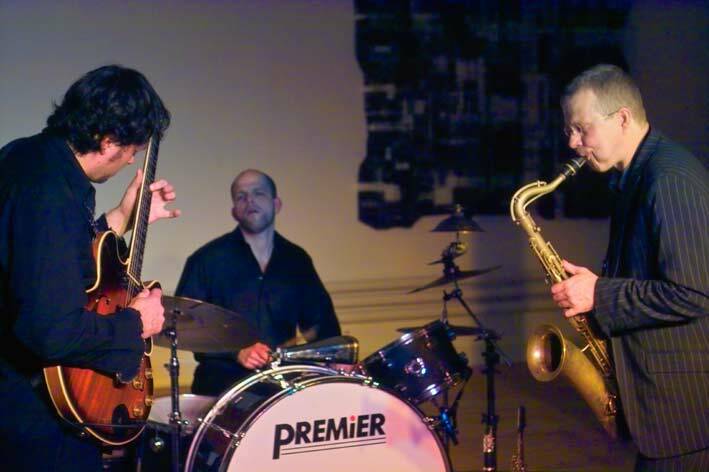 The unusual jazz trio setup consciously abstains from deep sounding instruments thus developing an individual tone aesthetics which through its open, light character, creates a lot of room for detailed compositional work, improvisation and communication as a foundation for the search for undiscovered colours and shapes in Cole Porter’s magnificent music. The Cologne saxophonist Claudius Valk, with his trio, reinvents Cole Porter’s musical compositions anew. Whoever is interested in jazz will at some point come across Cole Porter. He wasn’t a jazz musician, rather a composer of musicals, but generations of jazz musicians have worked with his songs. Claudius valk and his trio, Low Cut Experience, are now on tour with a Cole-Porter-programme but they don’t play comparable easy mainstream arrangements. The Cologne saxophonist and clarinettist uses Porter’s melodies as a jumping off point to create contemporary musical images. In the Rittersaal des Vereins Schlaraffia in the Uerdinger Klöske, Krefeld jazz fans could now hear the Valk arrangements. Despite very good weather quite a few people did attend. In this somewhat unaccustomed atmosphere Valk and his trio demonstrated their joy in playing. In this trio Norbert Scholly plays the half acoustic E- guitar, besides that he is very knowledgeable in his use of the sequencer. Time and again he takes up so called loops (infinite loops) from his playing. At times they serve him as a partial accompaniment, but sometimes he superimposes so many loops that minimalistic tone worlds are created. Daniel Schröteler’s drum set sends one optically at first onto a false trail. With his large bass drum mounted with a cow bell, it is reminiscent of the good old swingtime, but Schröteler soon turns out to be a drummer who rather comes from the free improvisational scene. He rarely plays on his instrument with two of the identical tools, usually they are different like a brush and a drumstick. This alone produces unusual sounds. Valk who has often played in Krefeld does not really have to be introduced here. But now he surprises one again, simply by the number of instruments he plays equal skill: tenor and soprano saxophone, clarinet and bass clarinet. The most impressive is a long solo passage on the tenor saxophone where he lets the entire breadth of his range sparkle. From the light and sweet jazz sound to modern sound, everything was there to be heard. Even Valk’s Porter rearrangements exist from many, at times stark, choice superimposed opposites. Lyrical moments alternate with dramatic ones, delicate ballads hit the mark with heavy art rock. Current song forms do make an appearance, but have the effect of a quote, therefore long module improvisations often take place. In one piece Valk also alienates a Porter theme with the twelve tone technique. Exciting music was created which is not merely an hommage to Porter. Valk has rather created far more independent compositions.